Institutional investors expect reliable investment processes, consistency and transparency. FIRST PRIVATE has been responding to the complex challenges of modern asset management for 25 years. Dedication and professionalism have defined our approach to managing transparent, systematic investment strategies for institutional investors since 1991. We have maintained a focus on fundamental/quantitative investment strategies in the fields of equities and absolute return since the company was founded. We consider it our duty to act in a sustainable and responsible manner towards people and the environment when realising our investment processes. We have underlined our commitment to these values by accepting the code of conduct of the German Investment Funds Association (BVI) and signing the UN Principles for Responsible Investment. Our investment philosophy is based on four main pillars, which reflect our beliefs and ensure that our institutional investors benefit from reliable and comprehensible investment processes. Prices fluctuate more significantly than values. Our investment approaches are designed to identify valuation anomalies and irrational responses driven by market psychology. FIRST PRIVATE’s approaches are compliant with the findings of behavioural finance. Disciplined, quantitative methods based on fundamental “truths” are key to our systematic investment success. We believe in the long-term success of evidence-based investment strategies. Our quantitative processes are formulated stringently and implemented using a disciplined approach to ensure that typical behavioral errors are avoided. We know that it pays off to actively and continuously seek the most attractive securities. Our selection is determined solely on the basis of the fundamental analysis of a particular asset – not just its affiliation to an index. We work independently of benchmarks, which typically results in a high active share. Professional investors expect flawless and sustainable investment concepts. Our promise of success is based on product integrity and transparency. This means that we are able to keep you informed as to why a particular security is part of the portfolio at any time. We have been managing portfolios for institutional investors for more than a quarter of a century. Systematic investment strategies in the fields of equities and absolute return have always been central to our institutional asset management. The combination of our long-term fundamental convictions and empirical findings plays a pivotal role in our investment processes, which are continuously developed according to the results of the latest scientific research. The focal point of our product development is always the risk-adjusted excess return (alpha) that is achievable in the medium to long term, rather than a particular dogmatic style. It is vitally important that the investment rules we apply are comprehensible and transparent. Unlike purely “mechanical” quant processes, we make a point of ensuring that the overall responsibility and control of risks are in the hands of highly experienced portfolio managers. A proprietary data infrastructure forms the existential foundation of our investment processes. We call it the FIRST PRIVATE Alpha Factory. 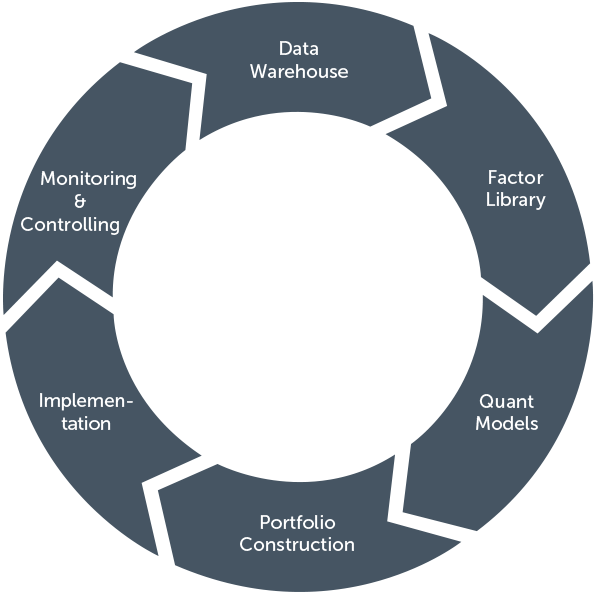 This complex data warehouse structure allows us to produce and research a variety of bottom-up and top-down analyses on a daily basis. The database includes information on 25 commodities, more than 50 currencies and invaluable balance sheet ratios of around 40,000 companies worldwide, with up to 1,000 data entries for each company and a history of up to 25 years. FIRST PRIVATE has a long-standing track record and offers tailor-made solutions to regulated investors. When preparing investment solutions, we are guided by the individual return objectives of our clients. We plan on the basis of individually agreed risk budgets, while taking account of balance sheet or regulatory requirements. We offer a complete range of active strategies depending on the level of risk appetite – from low tracking error to high alpha and from long-only to market-neutral strategies. As an asset management company governed by German law, we will provide you with extensive advice tailored to your needs. We offer our clients a broad range of investment solutions in the form of UCITS-compliant mutual funds, segregated accounts and outsourcing mandates. It goes without saying that we make sure our reporting is timely, clear and fully compliant with regulations. We deliver comprehensive transparency as well as supervisory assurance for investors subject to the provisions of the solvency and German insurance supervision law. This includes a thorough performance attribution analysis and extensive information on the positions in our fund. Our fund managers are always on hand to answer your questions in person before and during the mandate process. We aim to create partnerships on a peer-to-peer basis and use a targeted approach to provide comprehensive support in meeting your requirements and wishes. All client advisors at FIRST PRIVATE have many years of experience and expertise in institutional asset management. We develop suitable investment solutions in liaison with you. Just contact us – we are at your service at all times and look forward to hearing from you.